Authors: Timoshkin O.A., Medvezhonkova O.V., Troitskaya E.S., Tyutrin A., Yamamuro M.
The coastal zone of Lake Baikal includes shallow (from the water’s edge up to the slope margin), splash (buffer) and above-water areas. Complex, interdisciplinary studies of the current state of the coastal zone are very important both as a part of fundamental and applied research. The shallow-water zone houses maximally diverse groups of benthic organisms, including endemics (Kozhov, 1931; Gavrilov, 1950; Timoshkin, 2001). It has been found out that most of the species inhabit the shallow-water (coastal) zone of the 14 largest lakes of the world, 72% of them being totally confined to the littoral zone even in case the littoral part is the smallest of all lake areas (Vadeboncoeur et al., 2011). Relative abundance of evolutionary young species apparently originated from the inhomogeneities of the biotope and unique abiotic conditions of this zone, therefore, the shallow and splash zones may be considered an appropriate place to trace “first steps of endemic speciation" (Timoshkin et al., 2003; Timoshkin et al., 2011; 2012). Stony littoral of this rift lake provides favourable conditions for unusual communities of biofilms and attached organisms (sponges, lichens and algae) capable of destructing the rock. Biogenes appearing as a result of this process become available for other phyto- and zooplanktonic groups (Parfenova et al., 2008; Kulikova et al., 2008; 2009; 2011; Logacheva et al., 2009; Mal’nik et al., 2009; Timoshkin et al., 2009; 2011, 2012 a; b). The data obtained has shown that the shallow-water zone (including the splash zone) is under heavy anthropogenic load: the ground in the coastal and splash zone serve a buffer zone filtering the lake of the sewage waters flowing from the near-water settlements; the splash zone has accumulated most of the domestic waste encountered in the shoreline area. Current hydrochemical, microbiological changes in the water as well as variations in the phyto- and zoocenoses of the coastal zone have become the focus of scientific and other periodical publications, electronic resources. Abundant growth of macrophytes and blooms of filamentous algal species unusual for Baikal have been recently observed in the bays and creeks of the Lake (Timoshkin et al., 2012 a; b; http://baikal-info.ru/archives/21411; Kravtsova et al., 2012). There are still debates on the cause of this phenomenon among researchers. As recently evidenced, the coastal zone most readily responds to anthropogenic stressors. Interest of researchers to this zone is continuously growing due to the intention of Mongolian Government to construct hydro-electric dams in Selenga tributaries and transfer part of Selenga water for irrigation of Gobi Desert (http://www.minis.mn/eng/news/events/120-medee; Wild Life Foundation of Russia, 2012; http://www.ot.mn/en/node/2679). According to some expert opinions, it may result in 20% decline of the total water runoff from Selenga River and affect the water level regime in Baikal. Complex studies of the shoreline of Lake Baikal (including its land part) that may be regarded the background for many fields of biology and chemistry, were either not conducted or geographically limited, and hence evidently insufficient. Unfortunately, hydrology of the coastal zone Lake Baikal and water temperature dynamics in particular, remain poorly understood by Baikal limnologists. During В 1920-1940, annual regular and irregular measurements were performed at the transects and separate vertical profiles in the shallow coastal zone of Listvennichny Bay, opposite Abuteikha Pad, Istoksky, Posolsky Sor Bays, Rangatuy Sor and Proval Bay. These data were collected and analyzed by Rossolimo L.L. (Rossolimo, 1957). Insufficiency of original data (Krokhin, 1939; Kozhov, 1947) allowed the researchers to make a supposition on principal characters and some features of the thermal regime during winter cooling, under-ice, spring and summer warming up. While doing this study, L.L. Rossolimo also outlined further research trends that remain topical today. Water temperature data set collected in 2003-2006 near Berezovy Cape (Timoshkin et al., 2009) being rather informative (all-year-round measurements taken at different depths make up the majority of the present data base) still is only descriptive and insufficiently analyzed. Water temperature is one of the principal limiting factors of life activity and dynamics of aquatic communities. Temperature variations also affect other environmental parameters, for instance, the amount of oxygen, biogenic elements, organic substances, etc. The coastal zone of the lake is characterized by rather variable temperature conditions. As a rule, temperature elevation entails increase in the community abundance. The abundance peaks of benthic communities, living in the shallow and splash zones, are observed during warmest summer period. In winter, benthic communities are low in number, and the inhabitants of the frozen part of the splash zone try to migrate to the littoral area or burrow in the ground. The communities of the splash zone are well adapted to highly variable conditions of their environment, when temperature, wind activity and insolation changes are followed by fluctuations of the pore water and, as a result, limitation of their living space. Some researchers are under the opinion that the global warming processes are the main reason of recent changes in the coastal communities of Lake Baikal proven by the variations in pelagic systems (Izmest'eva L. R. et al., 2016). This viewpoint seems invalid in regards to the coastal benthic communities, since there are no data on the temperature dynamics in the near-bottom zone either of the whole Baikal or at least of separate lake basins. Preliminary measurements taken by individual researchers (see below) in some parts of the lake are unavailable so far. As mentioned above, such data are most valid in relation to current large-scale changes in ecology and biodiversity of the coastal communities. Fig. 1. Location of a standart transect at the ecological test site Berezovy and sites of temperature data collection. et al., 2009). Moreover, this book includes a schematic map of temperature measurement points located at test site Berezovy, depths, coordinates and other characteristics. The total number of near-bottom temperature measurements taken by the authors at this part of Baikal shoreline is 96575. One more lake region where perennial water temperature measurements were and still are taken in the littoral zone is Bolshye Koty Bay. These data collected in 2006-2007 again were partially presented as graphs (Timoshkin et al., 2010-2011) but without original observation sets. Besides the coastal lake zone, water temperature was sporadically measured in two tributaries of Baikal entering the lake within the Bay boundaries: Zhilishche Stream and Bolshaya Kotinka River (Fig. 2). Graphical presentation of temperature fluctuations in the area of Bolshye Koty Bay and Bolshaya Kotinka and Zhilishche rivers that we observed during summer expeditions of 2006-2008 were also published (Timoshkin, Zaytseva, 2009). Fig 2. 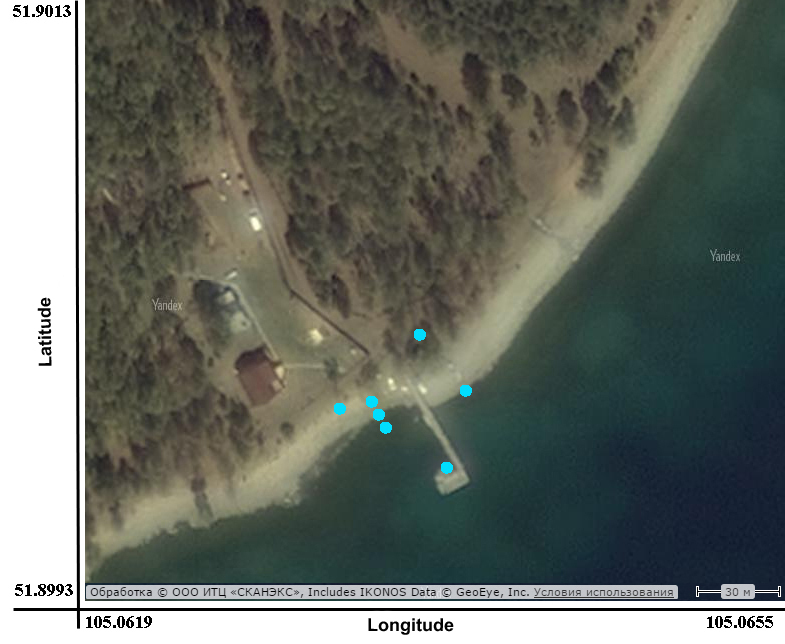 Location of temperature measurement sites at Bolshye Koty Bay. With the aim to study ecology of the splash zone and zone near the water's edge (see Timoshkin et al., 2011, 2012; Tomberg et al., 2012, Kulikova et al., 2012), as well as the effect of the air temperature on the near-bottom and interstitial water temperature, we irregularly measured the interstitial water and air temperature. For several years, the measurement sites were located right opposite the field station of the Limnological Institute SB RAS in Bolshye Koty Settlement (Fig. 2). As a rule, the loggers were located according to the following scheme: 1) at the depth of 3 +/- 0.3 m in the vicinity of the station pier (the water temperature was regularly measured during ice-cover period simultaneously by 2 loggers), 2) 1 m lakeward from the water’s edge, 3) at the water’s edge and 4) 1 m landward from the water’s edge. Two loggers measuring air temperature in the coastal zone were placed in a part of the beach protected from sunlight, approximately 5 – 12 m from the water’s edge. This distance varied as a result of the water level fluctuations in the lake. The location of three loggers measuring temperature near the water’s edge was also transferred manually following the water level variations. Measurements at the first site were taken during a year in the zone of the water’s edge and in the air during open water period, generally from May until October. The total number of measurements taken by us at this part of Baikal coastal zone is 34922 (air), 43903 (3 m depth), 11649 (water’s edge), 25780 (1 m landward from the water’s edge) and 11192 (lakeward from the water’s edge). Summing up, the present data base includes 239310 water temperature measurements taken in the coastal zone, 236071, or 98,6% of which taken on the western coast of Southern Baikal, region of Berezovy Cape and Bolshye Koty Bay. At present the measurements of the near-bottom temperature are continued. The loggers are located at Berezovy test site, opposite Chernaya Pad and field station of LIN in Bolshye Koty Settlement, as well as in Listvennichny Bay. Therefore, the database will be updated annually. Acknowledgements.We offer sincere thanks to our colleagues who kindly presented us with some of the temperature data loggers: Prof. Dr. M. Yuma (Japan), Prof. Dr. M. Moore (USA). Over 10 loggers were purchased by our sponsors. Data collection and creation of a database was partially supported by State Projects (2000-2010) № 0345-2014-003 «Present state, biodiversity and ecology of the coastal zone of Lake Baikal”, № 0345–2016–0009 «Large-scale changes in ecology and biodiversity of the littoral communities of Lake Baikal: interdisciplinary studies, factors, prediction” (supervised by Prof. Dr. Timoshkin O.A.) as well as a Joint Japanese-Russian Project KAKENHI No 15H05112 (supervised by Prof. Dr. M. Yamamuro). Gavrilov G.B. Faunistic diversity of the coastal zone of Baikal / /Priroda. – 1950. – №. 9. – pp. 67-69. Kozhov M.M. Study of Baikal fauna, its distribution and habitats // Proceedings of Institute of Biology and Geography at Irkutsk State University. – 1931. – Vol. 5, №1. – pp. 1-171. Kozhov M.M. Animal world of Lake Baikal. Ogiz: Irkutsk. - 1947. – 300 pp. Kravtsova L.S., Izhboldina L.A. et al. Disruption of the green algae vertical zonality in the open waters of Listvenichny Bay, Lake Baikal as a result of local anthropogenic stress // DAN. - 2012. - Vol. 447, № 2. – pp. 227-229. Krokhin E.M. Some peculiarities of winter temperature regime in the littoral of Baikal // Proceedings of Baikal Limnological Station AS USSR. – 1939. – №. 9. – pp. 133-147. Kulikova N.N., Suturin A.N. et al. First data on diversity, ecology and chemical composition of aquatic and semi-aquatic lichens (Lichenes) on the stony littoral of Lake Baikal // Siberian Ecological Journal. – 2008. - № 3. – pp. 399-406. Kulikova N.N., Suturin A.N. et al. Role of aquatic lichens in biochemical processes of the stony littoral of Lake Baikal // Inland water biology. – 2009. - № 2. – pp. 41-46. Kulikova N.N., Suturin A.N. et al. Geological and geochemical role of crustaceous aquatic lichens of Lake Baikal // Geokhimiya. – 2011. - № 1. – pp. 71-80. Kulikova N.N., A.N. Suturin et al. Biogeochemistry of the coastal zone in Bolshye Koty Bay (Southern Baikal) // Proceedings of ISU. Series “Biology. Ecology”. – 2012. – Vol. 5, № 3.- pp. 75-87. Logacheva N.F., Timoshkin O.A., Suturin A.N. Distribution peculiarities of microphytobenthos on artificial substratum – plates made of different geological rocks representing the bottom of the stony littoral at the test site near Berezovy Cape // Index of Animal Species inhabiting Lake Baikal and its Catchment Area: in 2 volumes. Vol. II. Basins and Channels in the South of East Siberia and North Mongolia. Book 1. Novosibirsk: Nauka. – 2009. – 933-935 pp. Mal’nik V.V., Timoshkin O.A., Boyko S.M. Preliminary data on qualitative and quantitative features of the microflora associated with underwater lichens and encrusting sponges of the family Lubomirskiidae, inhabiting different geological substrata // Index of Animal Species inhabiting Lake Baikal and its Catchment Area: in 2 volumes. Vol. II. Basins and Channels in the South of East Siberia and North Mongolia. Book 1. Novosibirsk: Nauka. – 2009. – pp. 888-891. Obolkin V.A., Timoshkin O.A. et al. Dynamics of the water temperature based on continuous measurements of StowAway TidBit Loggers at the test site near Berezovy Cape (Southern Baikal) and role of meteorological factors // IV Vereshchagin Baikal Conference. Abstracts and posters. September, 26 – October, 1, 2005. Irkutsk: Publ. Institute of Geography SB RAS. – 2005. – pp. 142-143. Obolkina L.A., Bondarenko N.A. et al. Under-ice plankton above the open littoral of Lake Baikal // Index of Animal Species inhabiting Lake Baikal and its Catchment Area: in 2 volumes. Vol. II. Basins and Channels in the South of East Siberia and North Mongolia. Book 1. Novosibirsk: Nauka. – 2009. – pp. 799-814. Parfenova V.V., Mal’nik V.V. et al. Communities of hydrobionts developing at the water-rock interface in Lake Baikal // Ekologiya. – 2008. - № 3. – pp. 211-216. Rossolimo L.L. Thermal regime of Lake Baikal // Proceedings of Baikal Limnological Station. – 1957. – Vol. XVI. – 552 pp. Timoshkin O.A., Sitnikova T.Ya. et al. Index of Animal Species inhabiting Lake Baikal and its Catchment Area. Vol. I. Lake Baikal. Book 1. Novosibirsk: Nauka. – 2001. – Vol. 1. - 832 pp. Timoshkin O.A., Zaytseva E.P. Dynamics of the water temperature in the shallow zone at the western side of Southern Baikal (in the vicinity of Bolshye Koty Bay, Bolshaya Kotinka and Zhilishche rivers) according to the data of ONSET StowAway TidBit Loggers // Index of Animal Species inhabiting Lake Baikal and its Catchment Area: in 2 volumes. Vol. II: Basins and Channels in the South of East Siberia and North Mongolia. Book 1. Novosibirsk: Nauka. – 2009. – pp. 732-759. Timoshkin O.A., Ivanov V.G., Obolkin V.A. et al. Water temperature dynamics in the shallow zone at the western side of Southern Baikal at the interdisciplinary test site near Berozovy Cape based on continuous measurements of ONSET StowAway TidBit Loggers // Index of Animal Species inhabiting Lake Baikal and its Catchment Area: in 2 volumes. Vol. II: Basins and Channels in the South of East Siberia and North Mongolia. Book 1. Novosibirsk: Nauka. – 2009. – pp. 727-731. Timoshkin O.A., V.I. Proviz et al. // Index of Animal Species inhabiting Lake Baikal and its Catchment Area: in 2 volumes. Vol. II: Basins and Channels in the South of East Siberia and North Mongolia. Book 2. Novosibirsk: Nauka. – 2011. – 1668 pp. Timoshkin O.A., Suturin A.N. et al. Biology of the coastal zone of Lake Baikal. Announcement 1. Splash zone: first results of interdisciplinary studies, their role for the ecosystem monitoring // Proceedings of ISU. Series “Biology. Ecology”. – 2011. – Vol. 4, № 4. – pp.75-110. English version published in Proceedings of ISU. Series “Biology. Ecology”. – 2012а – Vol. 5, № 3. – pp. 33-46. Timoshkin O.A., Vishnyakov V.S. et al. Biology of the coastal zone of Lake Baikal. Announcement 2. Detrital accumulations in the splash zone: classification, seasonal dynamics of the qualitative and quantitative characteristics of their composition // Proceedings of ISU. Series “Biology. Ecology”. – 2012b. – Vol. 5, № 1. – pp. 40-91. Tomberg I.V., Sakirko M.V.,Timoshkin O.A. et al. First data on the chemical composition of the interstitial water in the splash zone of Lake Baikal // Proceedings of ISU. Series “Biology. Ecology”. – 2012. – Vol. 5, № 3. – pp. 64-74. Timoshkin O., Wada Ei. et al. Landscape Ecological Approach in Lacustrine Ecosystems: Towards Establishment of the Universal Pattern of the Ecosystem's Monitoring // DIWPA SYMPOSIUM ' Perspectives of the Biodiversity Research in the Western Pacific and Asia in the 21-st Century. Japan. – 2003. – pp. 52-53.